After all of my great adventures I always love to do some baking. Fill my home with the smell of cookies and cakes. This week I have baked and baked until I could no longer stand the heat in the kitchen. I baked a fig upside down cake, a carrot cake and some lemon zucchini bread. Remember, these are healthy treats for you because they do have fruits and vegetables in them. Fruits and vegetables, even in baked goods, equal HEALTHY! As my baking was going on in the kitchen I sat at the kitchen table looking for my next adventure. I always lean towards somewhere exotic. I came across this contest sponsored in part by Hawaiian Airlines called “Flavors Take Flight.” All I have to do is enter one of my recipes in the contest and then get my friends to vote me up. If I am in the top 10, I get a chance to take my cookie recipe to Hawaii and share it on the local news station. Wow! Traveling, beaches and cooking! My favorite things! 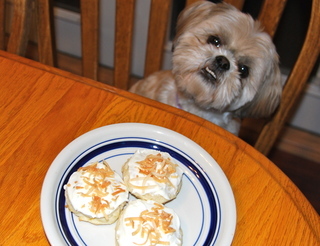 I tested these cookies on my family and even little Sidekick Suki. (She loves my baking.) They were a hit and I entered them in the contest. The first couple of days I shot up the charts to number 6. I knew I had this top 10 in the bag. Now over the course of just a few days, I have dropped to number Sixteen 🙁 . So I just need a few more hundred votes. The contest goes until this Saturday, September 24, 2011. Vote for my recipe at this link, then leave a comment letting me know you voted below for one chance. Ask 10 of your friends to vote and leave a separate comment telling me you invited your friends for another chance. We will randomly draw a winner on Sunday, September 25, 2011 at 12:00 am MST. The winner will be notified and we will send out the gift card the following day. Then the winner will enjoy a delicious PF Chang’s meal. Sounds easy? It is! Thank you for helping me get in and go to Hawaii with my cookies. Congratulations Matt! 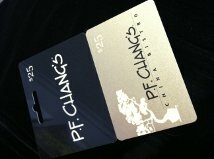 You are the winner of the$25 Gift Card to PF Chang’s. I just tipped you to 200 votes! Good Luck!! I shared it with all my Facebook friends!